This book focuses on the chaos that overtook England on the eve of the First World War. Dangerfield weaves together the three wild strands of the Irish Rebellion (the rebellion in Ulster), the Suffragette Movement and the Labour Movement to produce a vital picture of the state of mind and the most pressing social problems in England at the time. 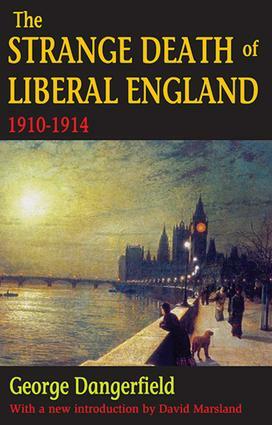 The country was preparing even then for its entrance into the twentieth century and total war.Dangerfield argues that between the death of Edward VII and the First World War there was a considerable hiatus in English history. He states that 1910 was a landmark year in English history. In 1910 the English spirit flared up, so that by the end of 1913 Liberal England was reduced to ashes. From these ashes, a new England emerged in which the true prewar Liberalism was supported by free trade, a majority in Parliament, the Ten Commandments, but the illusion of progress vanished. That extravagant behavior of the postwar decade, Dangerfield notes, had begun before the war. The war hastened everything - in politics, in economics, in behavior - but it started nothing.George Dangerfield's wonderfully written 1935 book has been extraordinarily influential. Scarcely any important analyst of modern Britain has failed to cite it and to make use of the understanding Dangerfield provides. This edition is timely, since the year 2010 has seen a definitive resurrection of Liberal power. Subsequent to the General Election of July 2010 the government of the United Kingdom has been in the hands of a Conservative/Liberal Democrat coalition. The Deputy Prime Minister is the leader of the Liberal Democratic Party - the direct successor of the old Liberal Party examined by Dangerfield. Five Liberal Democrat members of Parliament were appointed to the Cabinet and there are Liberal Democrat ministers in all governmental departments. After decades of absence from government power, Liberalism seems to be back with a vengeance.